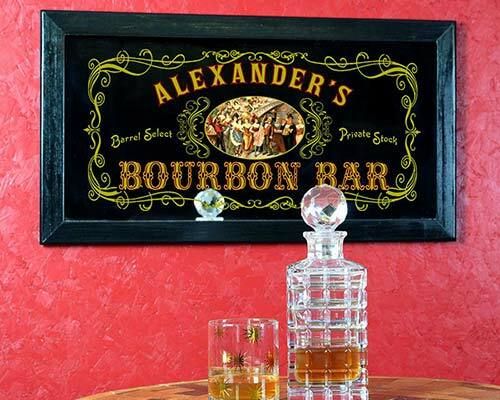 For the complete home bar experience, you’ll want some customized decor accents. Here are 21 personalized home bar accents that are unique and substantial but won’t break the bank. We are the official blog of Northwest Gifts and we participate in several affiliate programs as well. Many of the links below are affiliate links, which means we get a commission (at no cost to you) should you decide to get something on our recommendation. Perfect as Christmas, birthday, and retirement gifts, each one of these personalized home bar accents is about $200 or less and will be a great conversation starter. Prices are subject to change, click through to see actual pricing info and more product details. The best home bar decor accent is also something that you can use to improve the overall bar experience. 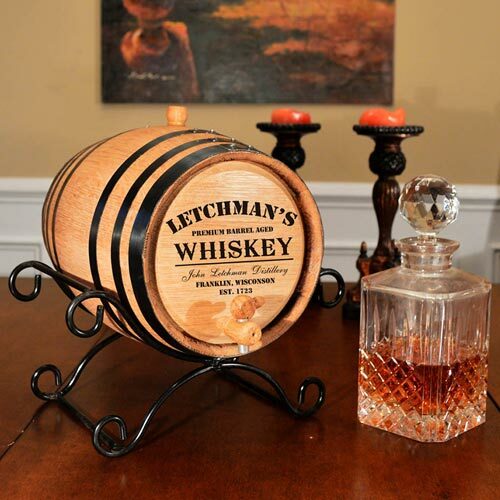 That’s why an authentic oak aging barrel is #1 in our list of personalized home bar accents. These oak barrels look great anywhere, plus you can fill them up and use them to age your own spirits. And lastly, of course, it is custom engraved with your name and more. Multiple sizes and designs are available in a price ranging from under $100 to about $200. Shop all styles here. Growlers are all the rage, and for good reason. 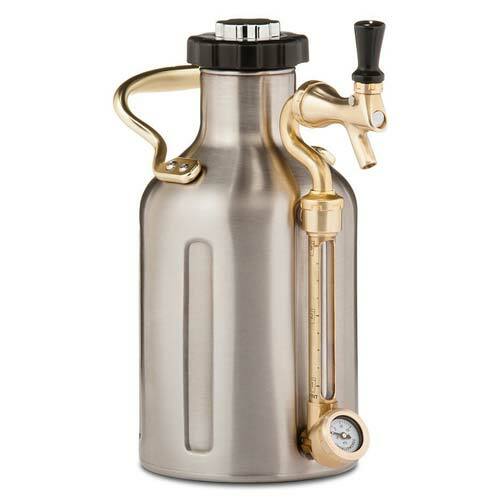 A good growler will allow you to take craft beer from the tap straight to your refrigerator for home consumption. This device takes it to the next level. The vacuum insulated stainless steel keg holds 64 ounces of craft brew and not only keeps it cold all day long, but keeps it tasting freshly carbonated for up to two weeks. No more flat beer! The downside is that you can’t personalize this – yet. There is a similar pressurized growler called the “ManCan” that you can get custom engraved here for under two hundred bucks. Boxed wine is a staple at great parties. It’s affordable, yet still tastes great, and keeps you from having to pop a cork every thirty seconds. The best way to class up your wine service is to use a wine serving barrel. 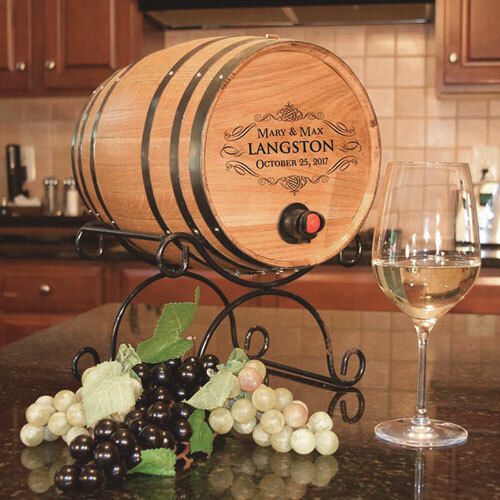 This oak barrel is custom engraved and easy to use when serving bagged or boxed wine. You won’t be ashamed to place it in the center of your party’s refreshment table. Serve your guests with panache. A personalized serving tray is just the ticket to add some flair to your home bar. 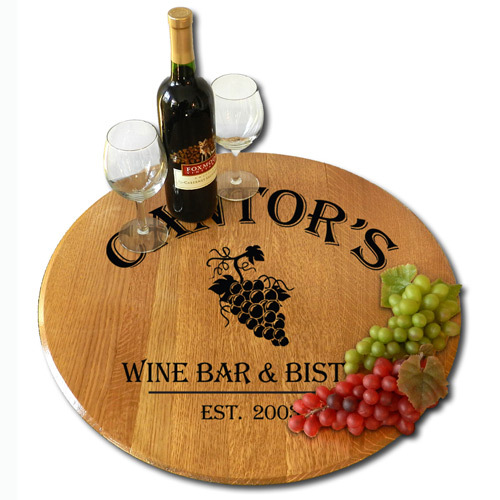 Choose from barrel head trays, quarter barrel trays, and wrought iron-framed wood tray designs like the one shown above, all custom etched just for you. Cork collecting is a light hobby enjoyed by many a wine connoisseur. 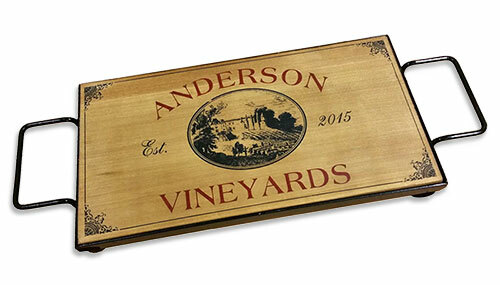 Keep those corks (or beer caps, or pub matchbooks, etc) within reach and on display with a personalized vintage cork catcher. Many designs, which include brew pub, brewing co. (pictured above), vineyard, cigar bar, old English pub, and more, can be customized for you here. The “Well Schooled Beer Connoisseur” sign (and “all-around drinking authority”) is a great gift idea to personalize for anyone who loves beer and has an old-fashioned sense of style. 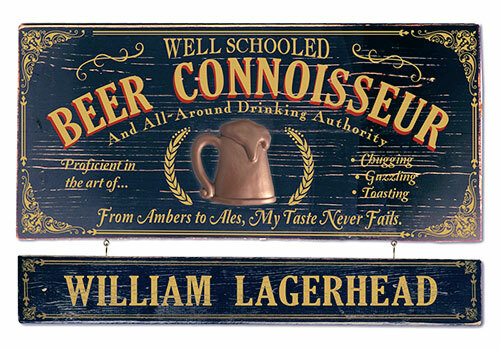 We also offer a wide variety of additional “connoisseur” signs, including Wine, Whiskey, Bourbon, and many more. See all here. 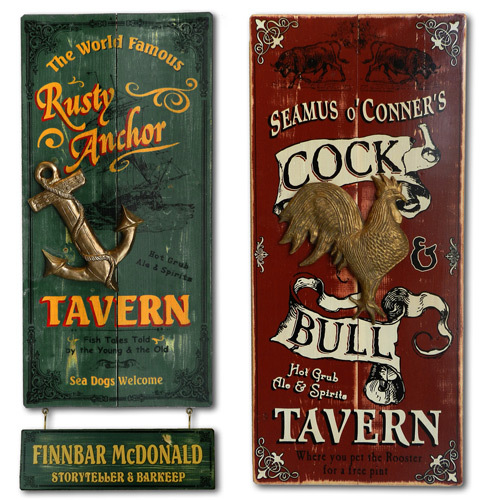 These old-fashioned distressed wood signs are made in the USA and add a wonderful accent to your home bar decor. 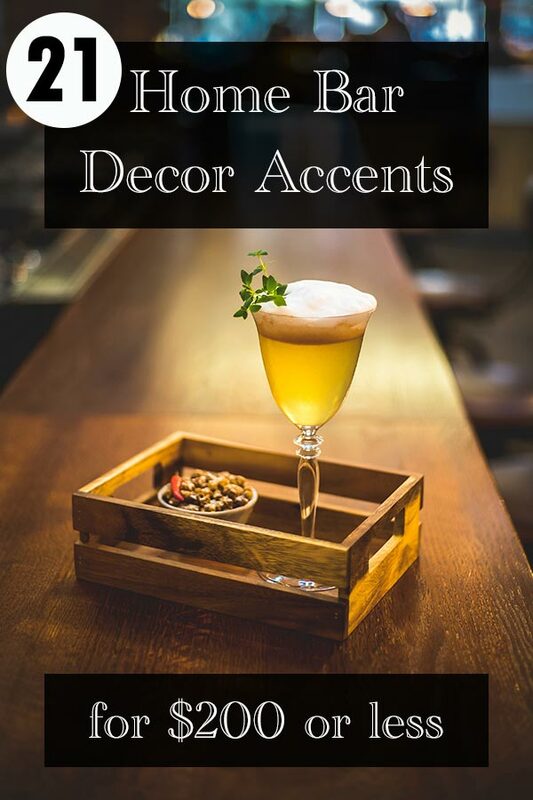 Here is a great old-fashioned idea for a personalized home bar accent. These vintage-style bar mirrors look super old-school, but are actually made to order for you right here in the USA and can even be customized with your name across the top. There’s the “Bourbon Bar” design you see above, plus many more, including Ale House, Irish Pub, Man Cave, Wine Bar, and more. The genuine wooden frame measures an expansive 26″ wide by 12″ tall. As for the mirror itself, it is solid glass and mounted in the frame with real wood backing. Arrives ready to hang. See all mirror designs here. If the vintage/antique style isn’t your thing, consider a more modern look for your home bar mirror. This mirror includes your name and established year around a centerpiece of clinking frothy beer mugs, solid wood and glass construction, and plenty of open mirror to give the room an expansive feel. Double the good times and great friends! This customized “quarter barrel” sign is designed to look like the top slice of a barrel. 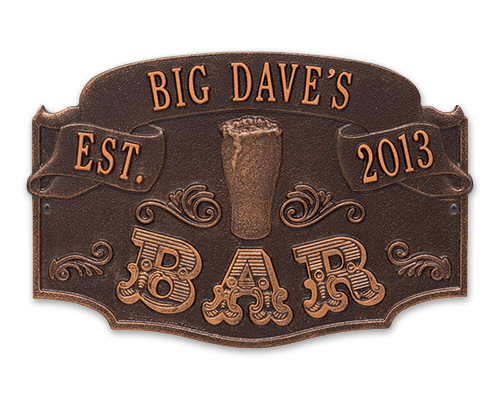 The unique personalized home bar plaque includes wooden side staves, a metal barrel hoop, and personalization of your name over top of the three-dimensional beer mugs applique and neighborhood tavern design. 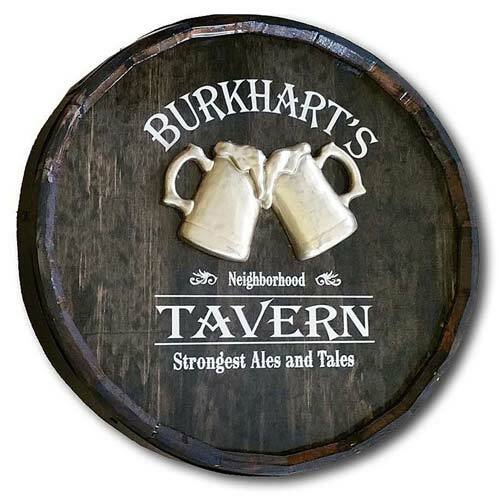 You can see more “quarter barrel signs” here, including themes for wine, whiskey, rum, bourbon, etc., plus Irish Pub, German Biergarten, Ye Olde English Pub, and many more. Live a little, drink a little, dance a little. Personalize your home bar with music! 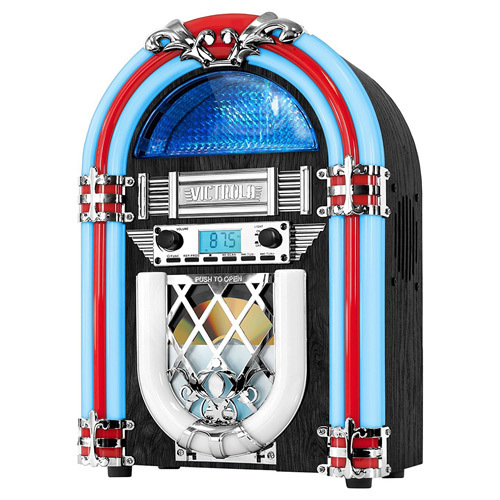 A retro jukebox like this gives your home bar an old-school 1950s diner feel. So maybe it is not personalized per se with any sort of custom engraving, you get to customize it all you want with the music you choose to play. Not just FM radio but also CDs and BlueTooth for use with any device, your home bar will surely benefit from the addition of mood-setting music from this lovely retro jukebox. This solid and spacious Lazy Susan is crafted from a 21″ solid oak wood barrel head. It is made in the USA and custom engraved with a vineyard grapes design that features your name and established year. The perfect accent for the home bar! Other designs are available here. These include barrel head Lazy Susans with themes for wine, whiskey, rum, vineyard, tavern, and many more besides. Competitively throwing sharp pointy objects goes well with alcohol. 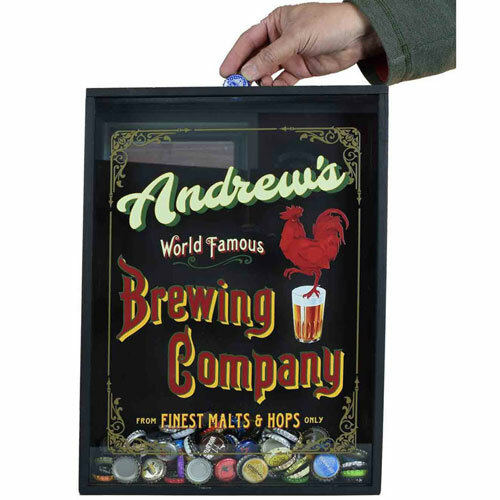 So what could be a better accent for your home bar than a dartboard and score keeping set? 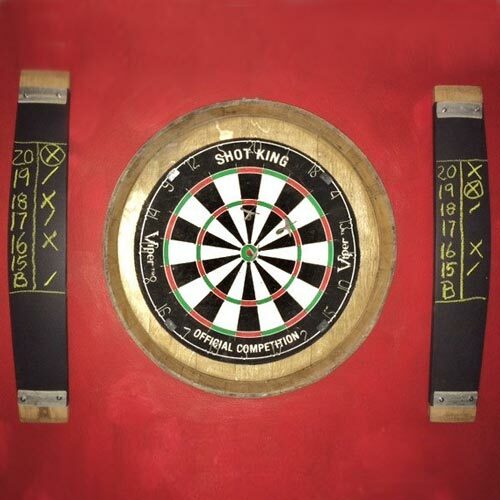 A professional dartboard is mounted to an oak barrel head, and you can keep score on the barrel staves which have been converted into chalkboards. Add a bit of fun and barrel flair to your decor! The chalkboards provide plenty of additional opportunity for personalization. Not only can you use them to keep score, you can also use it for a wine or tap list, take odds on who is going to win the dart competition, list tonight’s menu, and more. 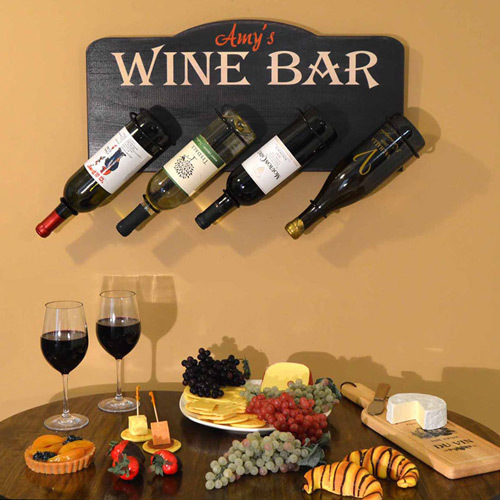 Display up to four of your favorite wines on this personalized wall-mounted wooden wine rack. Made in the USA from furniture grade wood with wire wine bottle holders and finished by hand. Sign reads “WINE BAR” and includes your name personalized across the top. Arrives ready to hang. These gorgeous metal bar plaques are made to order in the USA from premium cast aluminum and include your name and year permanently personalized into the sign. This is just one of many designs, each of which is available in 5-7 finish types. Choose antique brass, copper, bronze verdigris, oil-rubbed bronze, and more. This here is the centerpiece your home bar needs. A great oak wood barrel head is made to look like the top “quarter” of a barrel, complete with staves and steel hoop. The top is finished with a lovely vintage stain, and the “bourbon bar” theme is incorporated into the clock numeral design. And, of course, it includes a real working clock and personalization of your name and year. 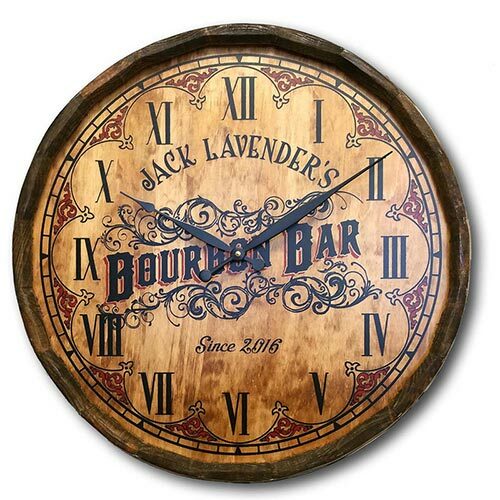 The 21″ diameter Bourbon Bar Clock Barrel Head Sign arrives ready to hang (with just a bit of assembly for the clock) and is made in the USA. More personalized clocks, including barrel head, vintage style, and wooden plank clocks, are available here. Vintage is a great look for an old-fashioned home bar. At Northwest Gifts we have tons of wooden plank signs in all manner of styles. 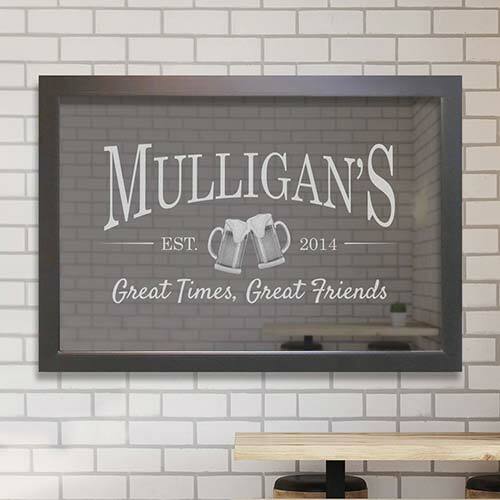 From Irish Pub to fancy Wine Cellars, from Sailor’s Pub to Moonshine Distillery, there is a personalized wooden sign that will suit your decor. Find yours here. 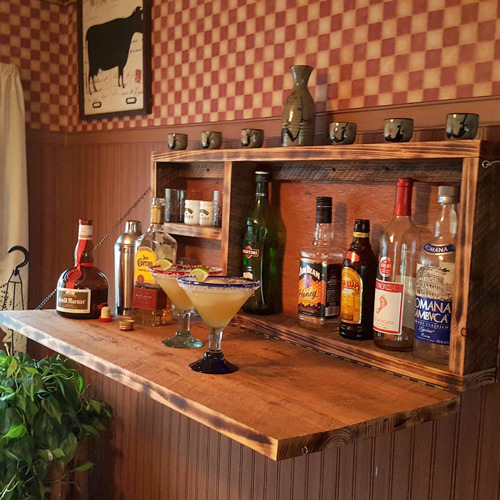 If you are short on space but still want to create a home bar, you may want to consider a Murphy Bar. This wall-mounted liquor cabinet can be hung just about anywhere, and not only stores your bar supplies but also turns into a mixing and serving station. The cabinet above is a very popular, well-reviewed item that is affordably priced but does not include personalization. You can customize the front yourself by hand-painting or the use of stencils. Question: When is a globe not a globe? Answer: When it is a minibar! 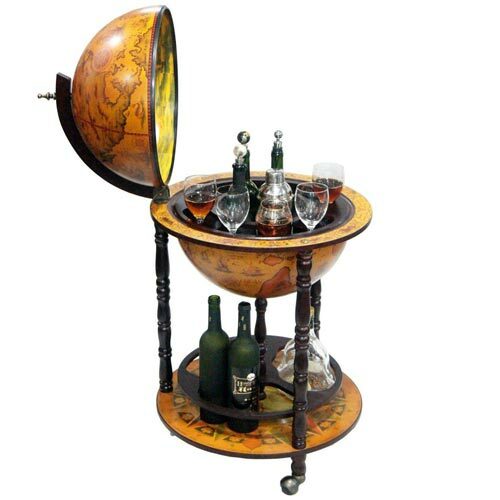 Terrible jokes aside, this gorgeous antique-style globe adds a richly cosmopolitan feel to your home bar. It helps you tuck away the liquor until the opportune time, when – presto! – you reveal your beverage of choice and glassware. You can easily personalize this globe minibar liquor cabinet by marking all the places you have lived or visited, or dream of someday visiting! 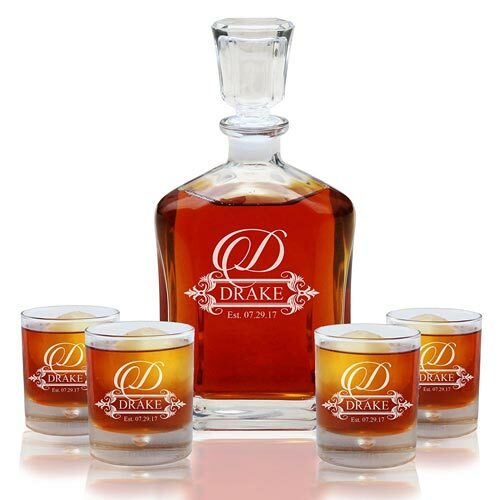 A sophisticated 5-piece barware set for the whiskey connoisseur, each glass is custom laser etched with your name, initial, and established date. The matching personalized glass whiskey decanter will serve well as a home bar centerpiece. Meanwhile, I’m sure you will find a way to put those whiskey glasses to good use! 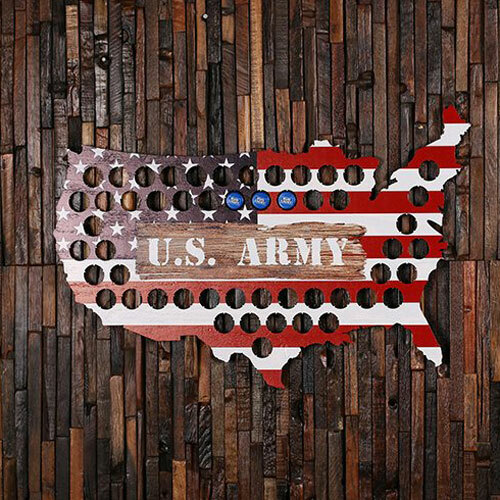 Collect beer caps and install them in a map of your favorite country (GO USA!) or state. These are available in just about any state and other popular shapes, and can often be personalized. 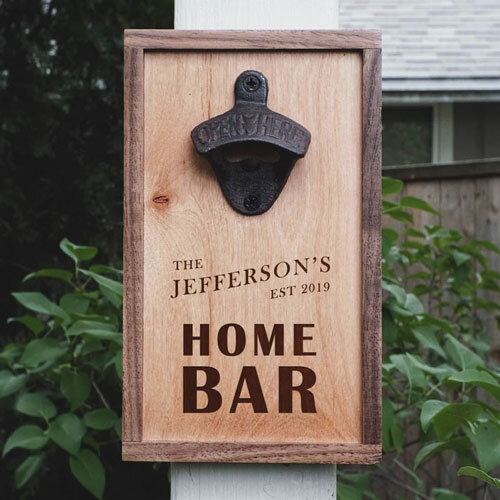 Crafted in Oregon using real Maple and Walnut woods, this wall-mounted bottle opener comes with a laser engraved “Home Bar” theme. Designed in classic and timeless style, personalize yours with your name (or family name) and year established. What a wonderful thing to have a bar in a house. It can play an important role to release stress and be a gathering place for family members.